Every year I cook two Prime Rib Roasts for my family (one for my side of the family and one for my wife’s side of the family). Neither families like turkey and even though I’ve suggested a different main course my family always requests a Prime Rib Roast… I guess if it works, don’t fix it. 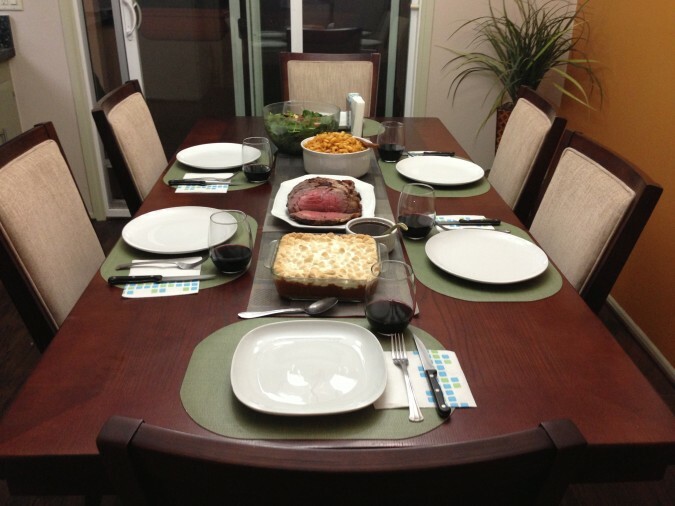 I’ve already done a post in the past about how to cook a Prime Rib Roast, but this year I tried a different cooking method which actually worked out better than my previous method, so I wanted to share the new cooking method which cuts the cooking time down. In the past the cooking method I used was low and slow then searing the crust at the end. 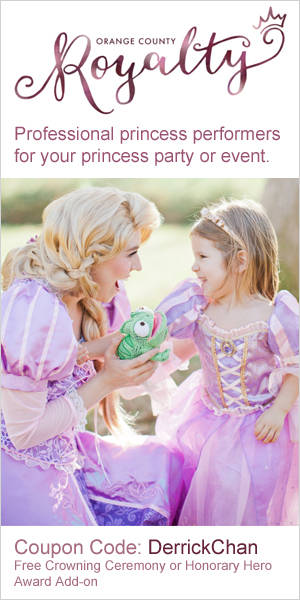 Although this method works well, it takes forever! Instead this year I wanted to try a faster cooking method so instead of starting low then searing at the end, I wanted to sear it in the beginning then let the residual heat finish off the Prime Rib. My previous method took up to 5 hrs whereas this new method only takes about 3 hrs total. I still recommend to dry age your Prime Rib for at least 48 hrs but you can still have a great Prime Rib if you don’t dry age it, just make sure you select PRIME and not CHOICE as the grade of meat. I know it is double the price but you get what you pay for and since you probably only eat Prime Rib once a year, do it right. Note: Please make sure to remember the exact weight of your Prime Rib Roast before removing it from the original packaging. 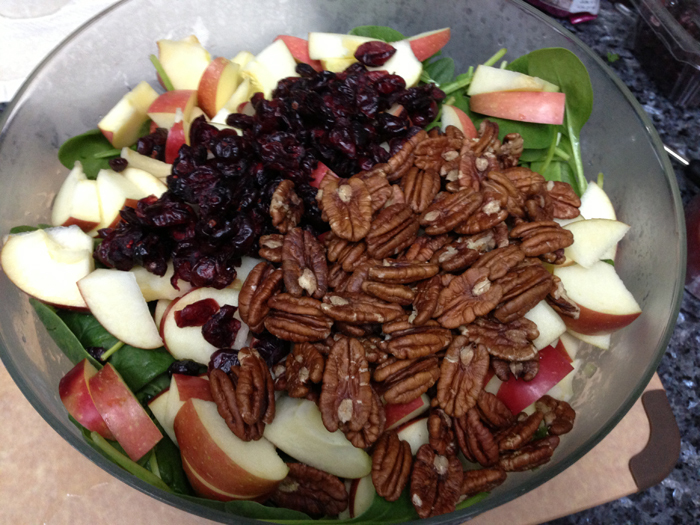 You will need the weight for this cooking method. Step 1 – Let your Prime Rib sit at room temperature for at least 5 – 6 hrs before cooking because this method only works if the roast is at room temperature. Preheat your over to 500 degrees F. While your over heats completely cover your roast with butter, now don’t freak out because the butter is going to melt off so the main value is the added flavor and it helps the seasoning to stick onto the roast. Add kosher salt and fresh cracked pepper all over your roast, add more than you think you need because you have to remember this is a large piece of meat and the center isn’t going to have any seasoning. So the crust should be extra flavorful and salty so when you eat the crust with the center meat it blends together perfectly. 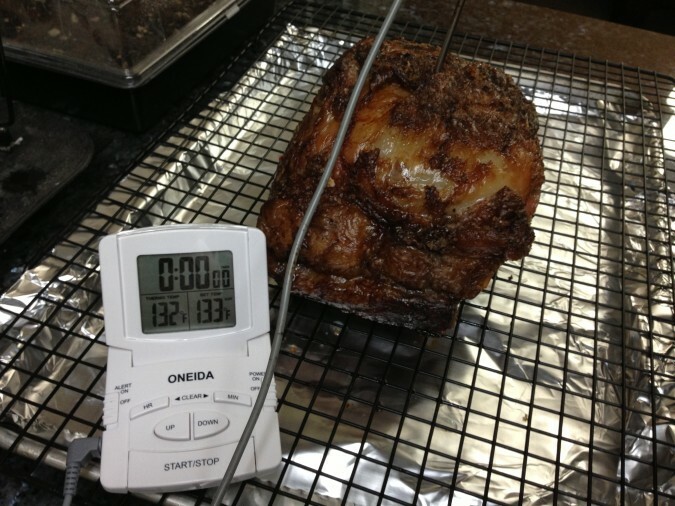 Once the roast is completely buttered and seasoned, stick a probe thermometer into the center of the roast so the tip of the thermometer is in the center. Now we need to calculate the cooking time, this is where you need the weight of the roast. In this cooking method you are going to cook the roast at 500 degrees F for X minutes, then turn off the oven and let the roast cook in the residual heat for 2 hrs. 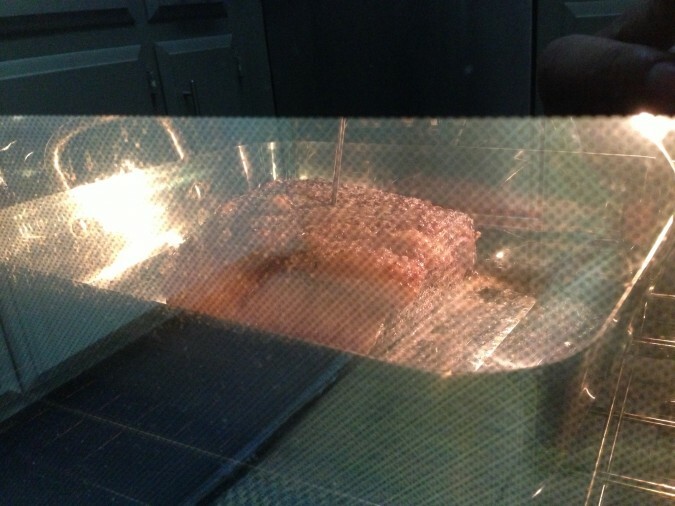 To calculate X take the weight of the roast and multiply it by 5 to determine the time to cook at 500 degrees. So if your roast is 4.83 lbs x 5 your cooking time is 24 minutes (rounded down). 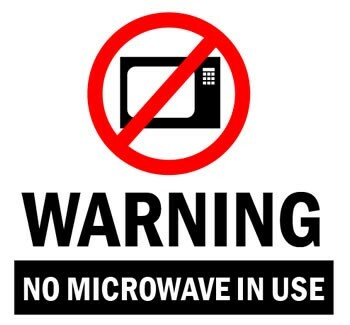 After 24 minutes you will turn off the oven and let it cook for the next 2 hours (do not open the oven door!). Even though the recipe says to let the roast cook for 2 hours after you turn off the oven I still like to use a probe thermometer because Prime Rib isn’t cheap so I would rather know for sure that it isn’t overcooked. Set the probe thermometer alert to go over when the internal temperature reaches 128 degrees, your target temperature is 130-135 for Medium Rare and 135-140 for medium. I always serve my prime rib at medium rare so I pull it from the oven at 128 but if you want medium then pull it out at 132. Remember the roast will continue to cook a few degrees even after you remove it from the oven due to carry over heat. Once the roast is cooked you will notice that the roast grows taller and also gets thinner horizontally, this is because the juices inside the roast cause the roast to plump up because the juice expands and moves around inside the meat while it cooks. 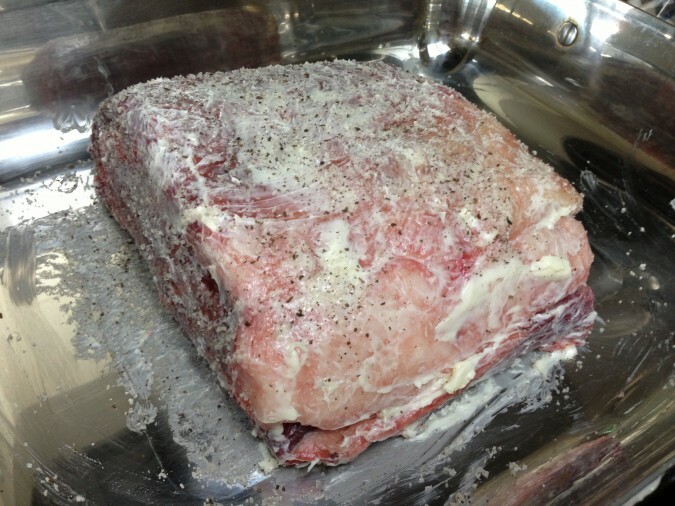 This is why it is very important to let the roast sit for at least 30 minutes after it is done cooking to let the juices settle back down or else when you cut into the roast the juices will come out of the meat leaving you with dry prime rib. If you want a juicy prime rib roast let your meat rest. 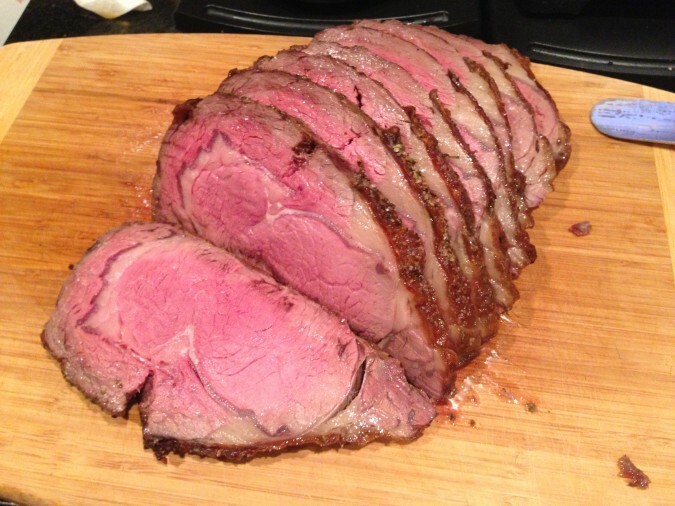 Once your roast has rested use a large sharp carving knife and slice your prime rib to the thickness you like. Personally I like them around 3/4″ to 1″ thick. To make the jus check out my previous post, serve and enjoy! Would you cook two 5lb roasts the same time as one 10lb? No, I actually cooked two 5 pound roasts this Thanksgiving for my mom’s side of the family. You would cook them still as one 5 pound roast because although the combined weight is 10lbs, the heat is still surrounding and cooking only 5 lbs of meat. I highly recommend using a probe thermometer still to cook any prime rib roast. Just stick it into the center of the smaller of the two roasts. 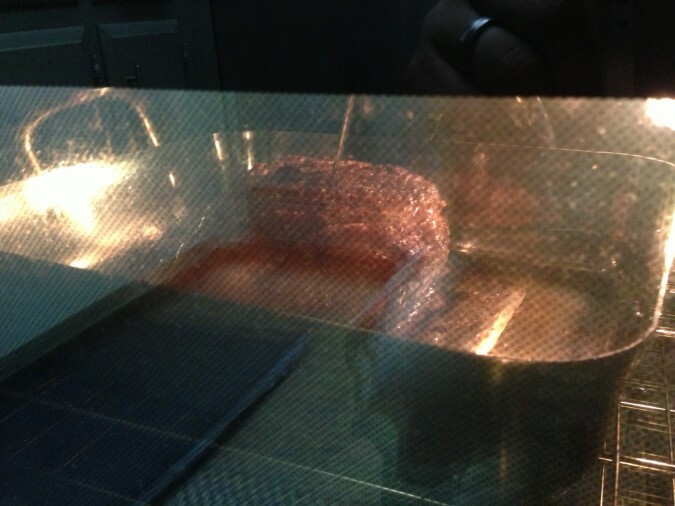 That way for sure both roasts will not be overcooked (you can always cook the larger roast more if you need to).